Quick update on my 1/35 Hetzer tank. I’ll be ready to start chipping and dusting with pigments soon! Yeah! Notice the peeling paint effect on the muffler (achieved with the hairspray technique). The block on the front right fender is in fact hardwood tied with metal bands, so the paint job will have to be corrected. It was used as a base support for the jack if needed. Next project on the workbench, an Academy Model 1/35 “Hetzer”. I’m done with the base paint, so the fun may begin with weathering (yeah!). 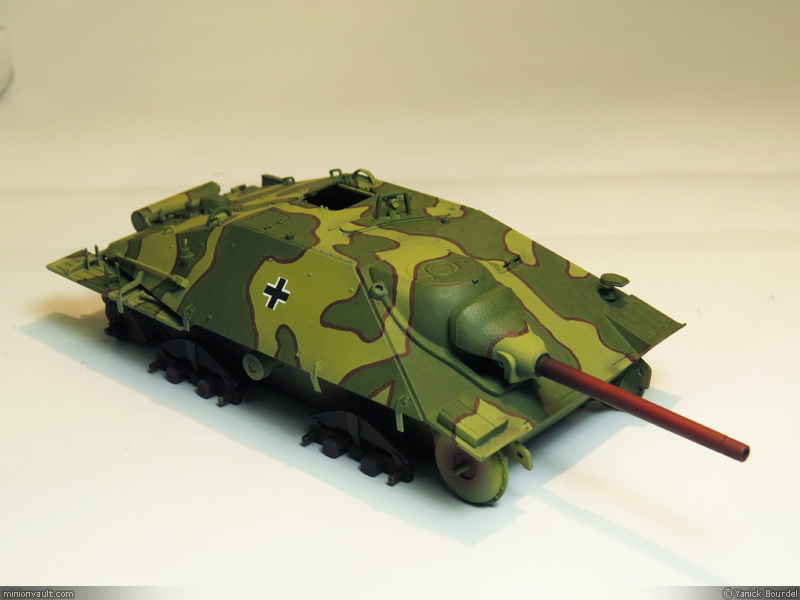 It is a nice model, but so small for a 1/35 tank: Hetzers were slightly bigger than a minivan… The paint on the photos look a bit greener than it is really. The light “green” is in fact dunkelgelb, which is yellowish beige (slightly green) normally. Anyway, it is just a quick peek: I’ll have better photos for the final model. I tried the hairspray technique to make rust on a few 1/35 oil drums I had lying around. 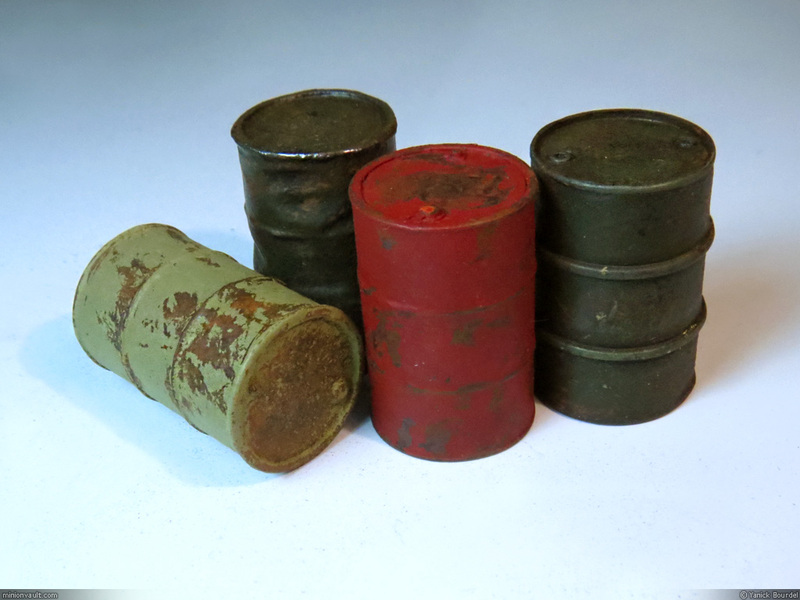 1/35 oil drums with rust effect and paint chipping. I need to add a wash to these to make deeper shadow areas. As I mentioned in an earlier post, this model is a Tamiya 1979 model, restored and repainted. It was missing its main gun, handles, tow cables and hooks, and was in a pretty bad shape. The tracks were pretty low quality too, having details just on the outside part (the inside of the tracks was completely smooth). 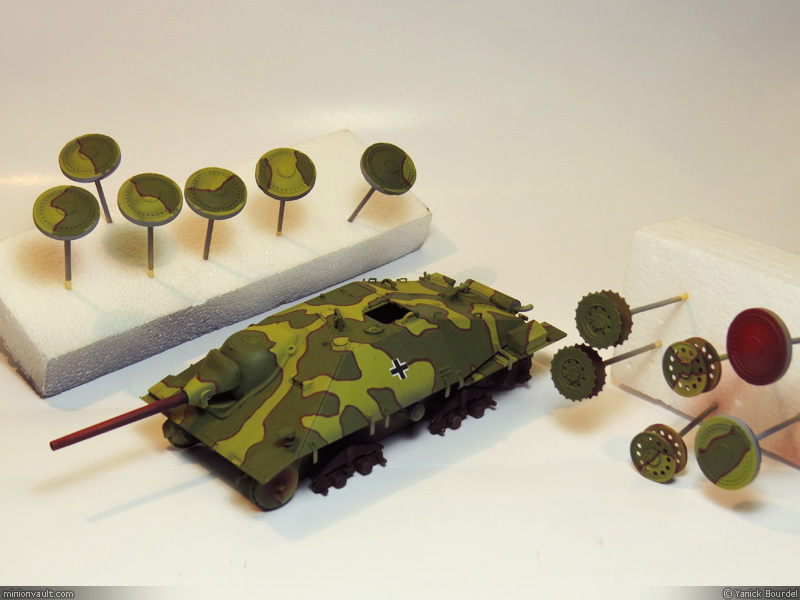 I replaced the original tracks with a set of higher quality vinyl tracks from a KV-1 Trumpeter kit. I used this restoration as an opportunity to test many different weathering techniques. In retrospective, I think I went too far with chipping and rust, considering the history of this tank, which mostly roamed the battlefields for 2-3 years… Not a lot of time to rust so badly if you think about it, so I am not sure if it’s that realistic. But it sure was a lot of fun, and it conveys the overall feeling that Russian tanks were ‘crude’ but fierce machines, designed to handle punishment. I am pretty much done with this model. I will make a small display base (very simple roadside like diorama) in a clear plastic presentation box (originally for car models). WWII Russian KV-2 tank (1/35 model, Tamiya 1979) restored and completed!